I told Jonathan that I saw that some people demoed their Airstream in 2 days! If they can do it in 2 days, so can I. 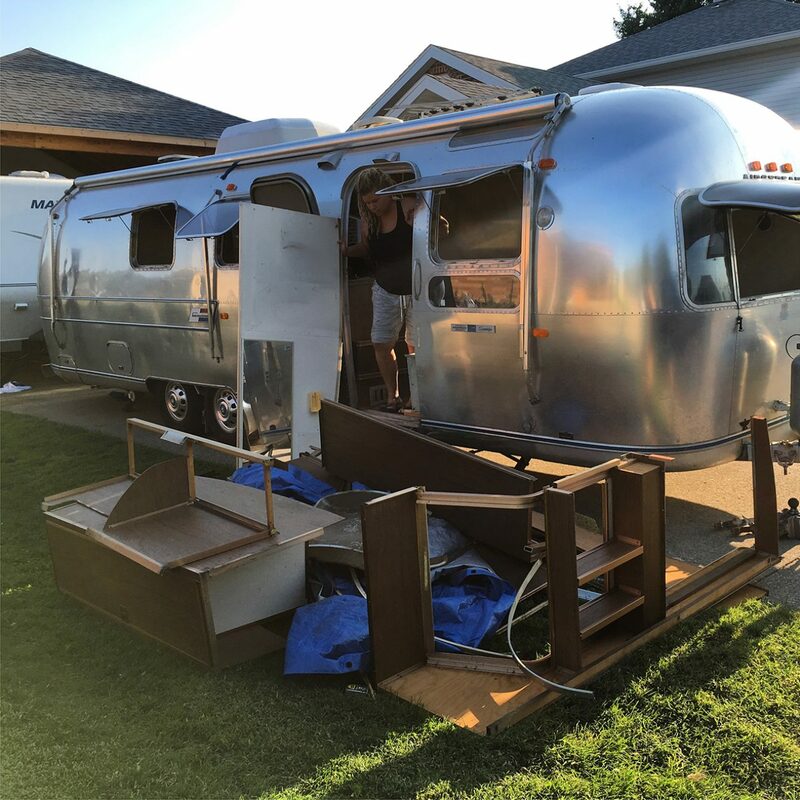 But the thing is, I have never demoed an Airstream before, so...my 2 days turned into 7. Turns out, there’s a heck of a lot of rivets in an Airstream. And when thing one is connected to thing two which can’t be removed until you loosen thing 3 and then kick thing 4, it takes a lot longer than you thought. Then your all like, “why won’t this tambour door come out?” and then the credenza table nearly falls on your face when you remove the last screw. That’s was what my first week was like trying to demo the darn thing. Luckily, the first week Jonathan was able to be done with work soon after his lunch break, and helped me remove all the things. It looked to be a never ending job but we finally got the Barestream gutted and what a difference one week made. We even took time to try our hand at removing the vinyl from the interior walls, just to see if it would work! Well, it works, but it takes a really long time. We didn’t do all the steps to make it shiny and beautiful...yet. We were just too exhausted from pulling it all off. Now I know why everyone is painting their interior walls white! That would have been much easier, but ‘someone’ wanted metal walls, so...metal walls he gets! Highlights from this week include a trip to Lowe’s to find some last minute supplies. And lots of fun with the 8 track. Now, on to week two!